Does Your Pastor Serve as Your Holy Spirit? You say to Brian that he is “given the same Holy Spirit anointing if you are a believer.” Now, I don’t want to get into speculating on who does and does not have what Holy Spirit anointing, but I do believe it is significant that conservative/fundamentalist evangelicals largely discount the empowering presence and work of Holy Spirit in believers’ lives. For example if you look at what T4G says they affirm and deny (http://tinyurl.com/md3xodt), their only mention of Holy Spirit is that He is a member of the trinity. They appear to leave Holy Spirit out of the salvic process when they say that they deny “that the truth of the Gospel can be expressed or grounded in anything less than total confidence in the veracity of the Bible, the historicity of biblical events, and the ability of language to convey understandable truth in sentence form.” The whole emphasis is on right thinking, to the point of looking like salvation depends upon it. I haven’t thought it all through, but it really does seem to me that, in conservative/fundamentalist evangelicalism, Holy Spirit has been replaced by Theologians. Jesus said, “When the Theologians come, they will guide you into all the truth.” NOT!! I said an audible, “YES!! !” when reading Gary’s comment. In thinking back to my first week at BGBC, I felt something was off. I couldn’t put my finger on it. I now know that this was the Holy Spirit warning me. In many of today’s high-controlling churches, regular church members may be squelched from the Holy Spirit’s guidance. If you feel the Holy Spirit’s guidance and tell church leaders, it seems it must pass their litmus test first for validation. Church leaders have become the test proctors of whether or not you actually heard from the Holy Spirit. Who gave them this authority? Does anyone put them through the same litmus test? Essentially, pastors or church leaders served as our Holy Spirits. I’m curious about those who have been involved in high-controlling or abusive churches? Where was the Holy Spirit? Were regular members allowed to share how the Holy Spirit was working in their lives? Was there any discussion about the Holy Spirit? Did the church leaders express how the Holy Spirit was leading them? How does the Holy Spirit work in the lives of believers these days? I tried to look up popular church leaders to see if they had online comments about the Holy Spirit. I found a list of quotes compiled by Trevin Wax on The Gospel Coalition website. I’d like to share a few of those quotes from some notables. And last, but not least this one. Guess who said it? I’m not sure if that was an oopsy-daisy on Mr. Wax’s part, but that last quote was by a woman, Corrie Ten Boom. I guess maybe she’s just telling her opinion, not really teaching men, right? It seems that this is yet another area in which we can test a good church or not: who holds the keys to the Holy Spirit? The believers or the pastor? I really don’t know why reading this post made me think of Aunt Lolly, but it did…. That amazing woman who raised 8 kids in the heart of Africa as a missionary, was my adopted grandma in many ways for many years… I don’t think I’ve met a more religious woman, but she had the most genuinely spirit-filled heart and attitude that I’ve ever seen. Never “preachy” or pushy… she just loved you for you. That church sign is pure blasphemy IMO! The utter arrogance of that pastor. I would run and not walk from that church. You’re so right, Hannah. The first year of living in Kenya, they had 5 kids, no electricity, no running water and lived in a tent. Lolly lived the love of Jesus. She was close to 80 yrs old, went on hikes with us, made sure we had enough time on the boat, pushed us into adventure – to jump off the high rocks into the lake, greeted us with hot chocolate after our long drive from VA to upstate NY in the wee hours of the morning. She even told me that she’d watch you kids at night so your dad and I could go skinny dipping in the lake – haha. I’ve never met anyone quite like her. Sorry, Tom. That sign is my doing. Reader Joel sent me the link where I get to make up my own church signs: I put in the words I want, hit enter, and then I get to copy the picture for a post. I’m so bad. 🙂 I’m totally cracking up now. Julie Ann: You got me did you not. Thanks I needed the laugh. I’ve been told by more than one “true believer”/fundamentalist that the Holy Spirit with us today is the Bible itself, and that everything needed is in there, provided it was interpreted properly. If the Bible tells us that we each will have the comfort and guidance of the Holy Spirit, then men wish to try and get people to deny that guidance, who should we really believe, and who are we really worshiping? When did “God-breathed and useful for teaching, rebuking, correcting, and training in righteousness” become “absolutely without error, 100% the voice of God spoken through man as hollow vessel”? The verse so often used to claim inerrancy never says anything to imply that we are just God’s megaphone; rather, it simply says that God breathed into men and produced useful writings to help us grow, not a set of rules which must be believed, understood, and followed with unquestioning perfection. There’s one other time in the Bible that talks about God breathing into something, and the result has turned out to be somewhat less than inerrant and infallible. When did “the Word” stop being Jesus Christ and become the Bible? Jesus told us to seek the Kingdom of Heaven in the midst of us, inside each of us and in the space between us. The Kingdom of Heaven doesn’t exist within the pages of a book, there are only useful directions to find the Kingdom in the book. Great topic! I don’t think the absence of the HS can be confined to conservatives and fundamentalists, by a long shot. He is at work in all churches, everywhere, and sadly shut out of all church, everywhere. It is notable that in Acts the chief evidence of the filling of the HS is the clear, free proclamation of the Word of God, so attempts to separate the two don’t have much biblical support. (Also interesting to note, the Spirit doesn’t move over Ezekiel’s valley of dry bones until he speaks God’s message to those bones (Ez 37), and in Gen 1 the word of God (“and God said”) works in concert with the Trinity, including the hovering Spirit of God.) In John 3, Jesus likens the life-giving Spirit to the wind, unseen and uncontrollable. So, since we can’t control the wind, how do we remove ourselves from its influence? We get out of it! THAT’S where the abusive churches come into play, IMO. They are so “air-tight” that the literally shut out and quench the HS, through continued disobedience and neglect of His voice. Love this stuff! I know my experience is going to be the odd one here. 🙂 We definitely believed in the Holy Spirit all right. The speaking-in-tongues, running-the-aisles version. And, truth be told, I counted that experience as very precious. Maybe I should just not comment on this one? Control freaks will always find a way. Interesting, Eric, you must have been reading my mind. 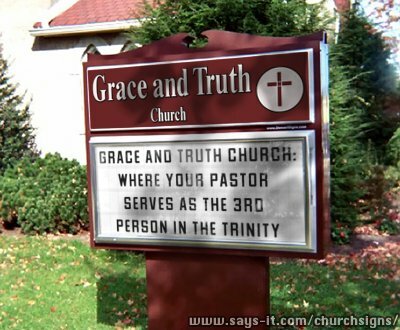 My first draft of the post (and church sign) was going to say the Trinity consisted of: The Father, Son, and the Holy Bible and then I switched it to the current sign. In the original draft, I included the passage in John 1:1, (word was with God, Word was God). While it is true that the Holy Spirit speaks to us through the Word, I think some pastors replace the HS with the Bible. I also think it is important to test the HS, but the point of my post is when pastors misuse their authority to BE the Holy Spirit or validate if something is the genuine work of the Holy Spirit. BTDT – Your comment is always welcome regardless of your background. I may or may not have told you that my husband and I spent our first 8 yrs of marriage in charismatic churches (Foursquare, Church of God, Assemblies of God). We met at a Foursquare church. I know my experience is going to be the odd one here. We definitely believed in the Holy Spirit all right. The speaking-in-tongues, running-the-aisles version. In John 3, Jesus likens the life-giving Spirit to the wind, unseen and uncontrollable. So, since we can’t control the wind, how do we remove ourselves from its influence? We get out of it! THAT’S where the abusive churches come into play, IMO. They are so “air-tight” that the literally shut out and quench the HS, through continued disobedience and neglect of His voice. Love this stuff! Yes! Excellent, Ken! I also agree that it is not limited to fundy/evangelical churches. Here’s a “running-the-aisles” video. I used to sing in the choir. Years ago, during one service over half the choir stepped down to run the aisles. Thanks for the video, BTDT! Were you part of the group who ran the aisles or were you “left behind?” lol. (You don’t have to answer – just having fun.) These folks are hitting 2 birds with one stone: they are getting a great aerobic workout in the midst of praising God. You guys see the ESS written all over that one? What does “equal in essence” mean but that the Holy Spirit is UNEQUAL somewhere else? Guess where……In ROLE!!! Sound familiar to what they teach about men and women? This is cultish thinking. Cults always tamper with the Trinity. BTDT, my mom’s family has been AofG since before AofG began (originally known as Shouting Methodists) but I have never heard of “running the aisles”. I’ll have to ask around. I split my time growing up between SBC/Independent Baptist churches and AofG and I still remember the first time I heard someone “speak in tongues”. I was shocked – it was so different from the sedate Baptist church services. I did think it was interesting my grandmother’s AofG church recently voted to remove their pastor – the members of the church made that decision, not the board of elders or deacons. Julie Anne, thank you so much for this post. It is so nice to be reminded of the beauty of what we believe – For all who are led by the Spirit of God are sons of God. If you have ever studied out the Jehovah’s Witnesses, they describe the Holy Spirit as “active force”, and not God, for there is only one God, the Father…period. So, to them, the Holy Spirit is unequal. They don’t even acknowledge that the Holy Spirit is a “he”…to them, the Holy Spirit is an “it”. Hi Lydia! Re @ 5:17 I believe “equal in essence” is a term used to protect the assertion that the HS is fully divine–just as “divine” as the Father and the Son. I believe the term was devised when it was being asserted that the HS might somehow be less than divine, or of a lower class or nature than the Father and the Son, or even was not a distinct, separate individual from both the Father and the Son. But the Bible does assert differing roles for all members of the Trinity, doesn’t it? Jesus seems more concerned with doing the will of the Father, though the Father is never found “doing” the will of the Son. (Re: Gethsemane, where the Son submitted Himself to the will of the Father, despite initially asking that “this cup” (of suffering) pass from Him. Likewise, there are ministries that were unable to occur until the Spirit came–but the Spirit was “sent” by both the Father and the Son (John 14:26, 15:26). I don’t think there is a valid correspondence between gender roles in marriage and the relationship between members of the Trinity (as some complementarians have argued), but… I also don’t see the Trinity as not having clear roles of its members, either, or the second and third members of the Trinity fighting submission to the Father and (in the case of the Spirit) the Father and the Son. What do you think? Please note that this is only my personal opinion, and not any kind of dogma that I am trying to espouse. You noted that Jesus was about doing the will of the Father. True. But since I don’t believe in the Trinity, I do believe that all three are the same God…in ONE person, not three persons. That being said, I believe that the Father is the SPIRIT (John 4:24), and that Jesus is the BODY of God. That being said, everything that the SPIRIT said, the Body did. If your body needs water, your mind will tell you to get a drink of water, and you obey your mind. You are being obedient to your mind. Even if you change your mind, you are being obedient to your mind. Likewise, whatever the spirit states, the body functions. In “essence”, I see God as Spirit/Body/Soul. Soul is the Greek word PSUCKE, transliterated to Latin is PSYCHE. We have the “mind” of Christ. I recently saw this referenced recently and it stopped me in my tracks. I was very surprised, but then not surprised when I realized it was someone within TGC or CBMW who was saying it. Hi Ed @7:18. You’re referring to the historic views on the Trinity, and hold a more Oneness theology? I know many have believed that through the ages, but I have not found their arguments to be compelling to me, esp. given the extensive number of places in the Bible where the three persons of the Godhead are spoken of as distinct from one another–but I imagine those arguments have not been compelling to you! Regarding your analogy: “If your body needs water, your mind will tell you to get a drink of water, and you obey your mind. You are being obedient to your mind. Even if you change your mind, you are being obedient to your mind,” I would ask this: What ever gave the “mind” the idea to “tell” the body to get a drink of water? Are you sure the body didn’t issue an order for the mind to dispatch all of the necessary actions required to provide the water ordered by “the body”? Are you sure the body didn’t issue an order for the mind to dispatch all of the necessary actions required to provide the water ordered by “the body”? Neurobiology backs up the deterministic functions of the body on the mind and consciousness (the brain issues commands before we are consciously aware of havng a volitional thought), and recent psychology research indicates that people will behave in less moral ways when exposed to messages that deny the existence of free will. Determinism not only posits a God that behaves in ways that fall far short of what people can conceive as ideal, it also is detrimental to human behavior. The overwhelming majority of our theology is nothing more than trying to fit an understanding of God into human limitations, no matter what appeals to authority we may make in our arguments. But, hey, none of that really matters if you’re one of the Elect, or have gotten your get out of hell free card, right? To answer the last question first, the brain is for motor skills, such as for sweating, when the body needs to sweat…your mouth gets parched, and so your mind tells you to get water. In regards to Oneness…yes, I am that. But knowing that the connection is with “Oneness Pentecostal”, I am not that. The Jews know full and well that the Holy Spirit is God. They also know that Yahweh is God. But we sure don’t here them thinking that the Holy Spirit is a second person of God. Not only that, there was a moment when the word Elohim was used in regards to ONE MAN, Moses. I just cannot fathom a ONE GOD in three persons. To me, you see, that decision was made by people that are dead. I wasn’t at the meeting. I didn’t get the memo. So, why am I, as a Christian, obligated to believe what they believed? Back in the day, I would have been burned at the stake for disagreeing with what dead men decided for me. I think that believing in three people playing the role of one God is a strange way to describe one God. So do the Jews, even in regards to 2 persons playing the role of one God. And yet, we are told, “It’s a mystery”. I’m just not buying that explanation that it’s a mystery. Julie Anne, I need help…please delete the last two. I keep getting it wrong. Hi Ed @ 8:51 You wrote, “I just cannot fathom a ONE GOD in three persons. To me, you see, that decision was made by people that are dead. I wasn’t at the meeting. I didn’t get the memo. So, why am I, as a Christian, obligated to believe what they believed?” Understood, although I do find myself trusting the stuff the dead guys thought and taught more than much of what is currently floating around! I honestly don’t know enough about the specific beliefs of the Oneness folks to venture much of a good discussion on the issue, so will just keep silent and try to at least appear knowledgeable! Hey Eric @ 8:23pm. Since Ed had presented his argument with the brain and the thirsty body by way of an analogy, I didn’t respond to his comments on a physiologic or anatomical level, but understand there is an amazing interplay of sensation-response that takes place between the psyche and the physical body. Regarding your statement, “The overwhelming majority of our theology is nothing more than trying to fit an understanding of God into human limitations, no matter what appeals to authority we may make in our arguments,” that seems a bit redundant: the only “understanding” possible and existent is that held by humans, so how could any discussion or formulation of theology NOT be constructed around human limitation? Is there any other kind of limitation to provide structure and boundary to theology besides that developed by humans? Ok, Ed, they are trashed (of course after I watched it and wondered what the connection was – lol). Julie Anne quotes Mark Dever as saying, “The church on earth experiences this unity only as its members are united in God’s truth as it is revealed in Scripture.” Dever signed the document that speaks of “the ability of language to convey understandable truth in sentence form.” In other words, it appears that Dever believes Christian unity exists to the extent we all think the same things, no doubt meaning when we all think the same things he thinks. If I correctly understand where Dever is coming from, I submit that this emphasis on right thinking is idolatrous. Jesus, not a litany of articulable propositions, is the Truth. While I don’t have it all sorted out, I would sooner say that we are united in our common membership in the Body of Christ, and also by our common sharing of the indwelling Spirit of God. I believe that this union will be manifested, not by our thinking the same things, but by our love for God, our neighbors, each other, and even ourselves. If God is love, and if we are in Him (Christ’s body) and He in us (by His Spirit), how could it be otherwise? If Dever is right to say that our unity depends upon shared thinking, our unity will pass away when knowledge passes away. If we are unified in love, which does not pass away, our unity will persist. I am, of course, referring to 1 Cor 13. Perhaps, therefore, it would be necessary to add that our unity is expressed also by a common hope and faith. In regards to your explanation of psucke, I have heard that many many many times before, beginning with the word Nephish. And Adam became a “living” soul. To me, the word “living” in conjunction with the word “soul” means that our mind is contained in a body. We aren’t living without a body…life requires a body. And so, a living creature is a soul, which is the definition of soul…a living creature. A dead soul is an existing soul without a body. I studied that long ago when I was debating the Jehovah’s Witnesses. They believe that your body is a soul, DUE TO the definition of soul being “a living creature”. But in the transliterations, soul is psyche. Mind contained in a body. When I hear explanations by preachers of soul from the Hebrew, I am not satisfied by just hearing the word Nephish. They don’t go deep enough in explaining it. You assert that the Father is never found “doing” the will of the Son. Although it likely doesn’t really matter, I wonder. Jesus said “And I will ask the Father, and he will give you another Helper, to be with you forever, even the Spirit of truth . . . (John 14:16-17a, ESV). We know that Jesus is is at the right hand of God interceding for us. Yep. Cheryl Schatz has a ministry to the cults of JW and Mormons in Canada. She picked up on ESS (Eternal Subordination of the Son) right away because she sees this sort of tampering with the Trinity all the time in those cults. She did a whole video on it using quotes from Ware, Denny Burk and others who are really pushing ESS as truth. In her video she talks about how the JW’s view the Trinity. What the guys at SBTS are really doing is reengineering the Trinity using roles for the inequality and pecking order. As we know one commenter on this blog even told us the Holy Spirit is subservient to Jesus Christ but called it EFS. ” Eternal Functional Subordination”. I like this booklet on the Trinity. It does a good job of answering Jehovah’s Witness and Oneness Pentecostal views. It includes a chart comparing the unique claims of God and Jesus, which should answer the ESS view. And I will ask the Father, and he will give you another Helper, to be with you forever, even the Spirit of ME (Jesus). We are told that JESUS lives in us. How can that be if Jesus is in heaven? Two places at the same time…oh, but wait, he is in all Christians. That is more than in two places at the same time. Omnipresent. Jesus is the Holy Spirit as far as I am concerned, as it is JESUS that lives in me. Wow. I didn’t expect that image to fill the whole comment thread… Oh well, it’s a good explanation. I think that it should read, “What I believe” rather than what Christians believe. Not all of us Christians believe in the same things in regards to non-salvation issues. I’ve already dissected why I don’t believe in Trinity, and I am content. I am also thankful that stake burning is not lawful anymore, but that steak burning is still lawful, although I like mine medium well, instead. Our roots are with the Jews. yes and no. And it gets very indepth and time consuming to go into this one. Just to back it up a bit, how was Jesus referred to in the OT within the One True God? Was the Holy Spirit working in the OT? And we have to make allowances when discussing this issue, the Incarnation and make sure we are talking during or eternity past/future. Another problem we have is we fail to understand Hebrew thinking. A “son” representing a father in business transactions was considered the same as doing business with the father himself. See John 5. That is why the Pharisees wanted to kill Jesus. He was “making himself equal with the Father”. We have the same issue with “sitting at the right hand of the father” which denotes equality. So we see all “persons” of the Trinity mentioned somewhere as raising Jesus from the dead. There are many other examples such as God calming the sea/Jesus calming the sea. Lying to God/lying to the Holy Spirit and on and on. So it is not really a cut and dried yes or no thing outside the Incarnation. I fear we have personalized the functions within the One True God so much we have made it smaller. @JulieAnne – Was wondering when you would come up with a zinger. @Eric F – I was wondering if the nearly anti-Holy Spirit doctrine would come up. I think it’s relevant. Almost like those churches are “throwing the baby out with the bathwater”. & Thank you for your “when did the word stop being Jesus and start being the Bible” addition. @lydiasellerofpurple & chapmaned24 – Baxter Kruger (http://baxterkruger.blogspot.com) uses a term you don’t see much… Perichorisis (http://www.theopedia.com/Perichoresis). I don’t think anyone really has a good handle on what “the trinity” mans or how that is enacted. What I do know, however is John 17 invites believers into that same relationship with God. So, the Son is going to ask the Father to send the Spirit of the Son. The word ONE in John 10:30 is defined as a NUMERAL. ONE as a NUMERAL is defined as, “A SINGLE UNIT”. Some wish to say that it means “ONE IN AGREEMENT”…..WRONG ANSWER. Both the Father (Spirit), and Son (Body) are in heaven. They are ONE (1), aka, a single unit. OUR INDIVIDUAL SPIRIT LIVES IN THE BODY OF CHRIST, on earth. We are in him, and he is in us. Yeah, it does, but it made sense to my sleep deprived brain last night. I was really trying to imply something more along the lines of “creating God in our own image” out of our psychology driving our theological positions. People go around declaring an absolute meaning of a doctrine based on one or two words verses they think irrefutably prove their position, in less of an attempt to achieve unity and spread love and more of making subtle threats against the eternal soul of another. Pete Rollins describes this need to be fulfilled by having certitude in a correct doctrine quite well as idolatry of God. No matter how much we jump around and shout,”THUS SAITH THE LORD!”, theology is nothing more than a personal opinion, and the constant scripture-whipping of people to bring them into conformity proves that quite well. I’m done with listening to threats against souls using the Bible and moving on to simply seeking wisdom from it to guide my life and love for others. I seriously doubt that God ever meant for the Bible to be little more than a weapon for intellectual wars. And so, I bid you farewell. May God bless and have mercy on us all. You and I have similar denominational experiences! BTDT, I just asked my mom about the “running in the aisles”. All she said in response was “The stories I could tell…” She has often wondered how much of it was a show and what was real. It is interesting to have a family history dating back to the 1800’s in the same denomination but my group of cousins seems to be leaving the AofG. I don’t know where my journey will take me next. I am disgusted by the SBC, want nothing to do with IFB and I don’t really identify with the culture of AofG anymore. On a side note, what is so special about Oneness Pentecostal? I have never heard of them before. Hi Eric @346am: Trust me, I’m not thinking that my (or anyone else’s) theological views should ever be touted as sacrosanct, or used to hurt or control people. I simply feel that everyone has some sort of “theology” that drives their lives. You’ve stated your theology clearly, “No matter how much we jump around and shout,”THUS SAITH THE LORD!”, theology is nothing more than a personal opinion.” I get what you’re saying, and think it’s fine for us to disagree about the nature and role of theology. No worries. Isn’t “provided it was interpreted properly” the same disclaimer the Mormons make about the OT & NT when it differs from the Book of Mormon? Both my husband and I LOL at your mother’s response. We know exactly what she means. I will say this, since the SBC never really taught on the HS, I had no idea how he fit into my life as a Christian except that he was part of the trinity. I credit the Pentecostal experience for giving me a greater awareness of his influence.I think that ties into what Julie Anne’s post is all about. About the Oneness Pentecostals, I hesitate to stick so much as my big toe into those waters on this blog. 🙂 I’m not interested in defending or denying these views at this stage of my life. It’s a view held by certain Pentecostals that God is one being who manifested himself as “Father in creation, Son in redemption and Holy Spirit in regeneration.” They also believe that these “unite in the singular person of Jesus Christ.” It’s a hotly debated view, and even considered heretical. BTDT, I’m still laughing at my mom’s response as well. She has told many stories from her time in the church that are not quite appropriate to share here. But that probably has more to do with our family’s history with the group going back over a hundred years. 🙂 I agree with you about not learning much about the Holy Spirit in the SBC. Its only been in the last two or three years since I stopped attending church that I have really learned to study the Bible and figure out what I believe and why. Don’t worry about going any further into the Oneness Pentecostals. Its just more for me to research and I love to research. 🙂 Blogs like SSB and TWW are so important for monitoring the current trends and alerting us to potential abuses. For several years I was uncomfortable with the teachings of Mark Drisc*ll and the like but I couldn’t quite identify why. Their investigative work and advocacy is incredibly important. Mandy – I remember when you first shared your family experience way back. My posts on Faith Tabernacle continue to draw a steady stream of people searching Faith Tabernacle. Most of the time I do not get outside commenters posting on those threads, but when I do, it can be lively (telling me I shouldn’t mess with God’s anointed). Through these blog articles (https://spiritualsoundingboard.com/category/churches-denominations/faith-tabernacle/) , people in these groups have contacted me privately. I’m very thankful for that. Those folks have just as much abuse issues as fundy churches. My heart goes out to them. Since Scripture refers to itself as truth (e.g. 2:15, and, especially 3:16-17), can we really say that an emphasis (such as Dever’s) on right thinking is idolatrous? There is certainly a very important place for it. For instance, you say that “Jesus, not a litany of articulable propositions, is the Truth.” Can we fully know who Jesus is without the word? Also, Paul says that there is one true gospel (Gal. 1:6-9). How do we know what it is without the word? It’s true that some things in Scripture can be emphasized too much; not everything is a salvation issue, for instance. We need the guidance and discernment of the Holy Spirit as we read it. There is a place for belief and a place for works, as James so well explains. If a confirmed atheist does a lot of good deeds, is he saved? Likewise, if a professed believer shows little love for people, is he? How did the 2nd and 3rd Century Christians know before the NT? Mortimer Adler makes this observation: “We think truly (or have truth in our mind) if we think that that which is, is; or that that which is not, is not. We think falsely (or have falsity in our mind) if we think that that which is, is not; or that that which is not, is.” Adler, Mortimer J. (2008-06-17). Aristotle for Everybody (p. 153). Touchstone. Kindle Edition. This is common sense, and yet it does not seem to me to capture what Jesus was getting at when he said “I am the way, and the truth, and the life. No one comes to the Father except through me.” (John 14:6b, ESV). This passage causes me to think that Scripture alone is not sufficient to bring us to the truth we need, which is Jesus. Scriptural truth, in the Aristotelian sense, requires a response to the Truth, who is Jesus. I also note that, if truth consists merely of knowledge, truth will pass away. Truth that lasts must somehow be wrapped up in faith, hope and love. God is love. Therefore if we do not have love, we do not have God, whether in the person of the Father, the Son or the Holy Spirit. Therefore, if we do not love, we do not have truth, or at least we do not have the Truth that counts. The fact that there is a great divergence of opinion as to what the Bible means is troubling to me. I see this divergence of opinion as an indicator that the Bible alone is not sufficient to lead us into the Truth we need. Perhaps, if one were forced to make a choice, there would be more value in watching and emulating somebody (a Christian) who knows how to love than there would be in merely reading Scripture and attempting to act on what is read. I would suggest that, ultimately, however we come by truth about Jesus in the Aristotelian sense of the word, we must walk out that small “t” truth in day to day life, being empowered by His indwelling presence, in order to attain to capital “T” Truth. All of this is really just to say that I have more questions than answers. On balance, I suggest that it behooves us to seek Jesus first, foremost, and only. Apart from this, and I am as guilty as the next person, the pursuit of merely descriptive truth, even from within Scripture, is of little if any eternal significance. If we have Jesus, if we truly have Jesus, all else, including truth, falls into place–or at least it is then possible for all else to fall into place. And yes, it is my perception that the emphasis on right thinking, on the acquisition of small “t” truth can be idolatrous, particularly inasmuch as it can so often appear to attain to only a “positional” relationship to Jesus, without a vibrant, interactive, ongoing and here-and-now life giving relationship with Him. I apologize that this is so long. I apologize that it is so short. Gary W – I do not believe that spiritual truth consists merely of knowledge, but I believe that knowledge is a necessary component of it. There are few things more ambiguous than love: What kind? How much? How often? To whom? I believe that God is mostly pleased by love that is motivated by love of Him, and that only believers are capable of that kind of love. I find it hard to believe that God intended for humans to find the Bible so difficult to understand that there would necessarily be a wide divergence of belief as to what it means. I think it is sin that clouds our understanding of it. Of course, He knew that we would fall into sin, but that didn’t alter His way of “writing” it. Lydia – Since God’s revelation is progressive, I think He holds us responsible only for what He has revealed until now, whenever now is. Jesus own disciples didn’t get it until he revealed himself from all the law and the prophets. There is a lot of treasure in the law and the prophets that are hidden in such a way that it takes a lot of digging to find it. It isn’t an easy task to find all the nuggets. I don’t believe that the Bible was written in such a way to be easily understood. I believe that it is hard to understand things on purpose, to motivate us to dig. We all may not have it right, but we are still digging. Since I haven’t seen a response from Gary about this yet, The Bible is the LOGOS of God in written form…hence Jesus is the Logos of God. Logos is defined as SPOKEN WORD, INCLUDING THOUGHT. There is another word for our English word, “WORD”. It is called Rhema. Rhema is when a person speaks someone else’s LOGOS. Logos is when we speak our mind. We must give an account to God. The word account is the word “LOGOS”. IF I quote you, that is rhema. If you quote me, that is rhema. But if it originates in my mind, and I speak it, it is logos. Jesus is the truth. The Bible is the LOGOS of God…his words. His word (JESUS) is truth (Jesus). I liken Scripture to musical notation. I can learn the names of all the notes, and I can memorized what notes make what chords, and I suppose I could study music theory. However, if I never practice a musical instrument, I will never be a musician. Similarly, I can spend long hours over a lifetime of years reading and studying scripture. However, unless I respond in obedient faith, unless I actually practice the faith, I really cannot be transformed into the image of Jesus. On the other hand, have you ever watched 2 and 3 year old children playing Bach and the other great masters on violin? They didn’t learn musical notation or music theory before acquiring the skill. They listened to the music over and over, and they watched and played with their mentors, and they practiced and they practiced and they practiced, until the skill was as ingrained into their beings, much as is the case for all of us with language. These young children actually progress faster than older students who learn by traditional, note reading methods, or so it is said. I perceive that it is the same with our Faith. Children with Godly parents or other Godly mentors may well enter and greatly progress in the faith well before they can read Scripture. So, though we can and should be grateful for Scripture, I’m not sure it is the best way of imparting or growing in the faith. We grow in the faith, which includes growing in love, by living/practicing the faith. Sure, I agree “There are few things more ambiguous than love: What kind? How much? How often? To whom?” Yes, it’s difficult, but that isn’t reason to minimize its priority in the life of a follower of Jesus. I dare say that if 2 and 3 year old children can master Bach’s Double Violin Concerto, we Spirit-indwelt children of the living God can make progress in the call to agape love. It’s not so much that I would diminish the place of Scripture, or the small “t” truth it contains, as that I would elevate the virtue of a zealous pursuit of a life spent in the presence of Jesus, becoming like Jesus. Maybe I am prejudiced by my own life experience. When I was a hyper-Calvinist, studying my Bible, parsing the Greek words, reveling in the logic of an air-tight theology, there was no victory. Actually, there was abject failure. Then I was blessed to be introduced to a pastor (a Southern Baptist ordained, tongues speaking one no less), and also to certain authors and other ministers, who were able to demonstrate and minister actual victorious life in the presence of our Savior. While I would not hold myself out as an example to be followed, it is my testimony that there is significant victory as to many of the ways in which my supposedly Christian walk was previously such a failure. I dare say some progress has been made over and above the merely positional salvation I claimed and held on to as a hyper-Calvinist. And all of this from one who largely continues to walk out his faith in the realm of the mind. No, I do not reject knowledge, just its sufficiency. Obviously, it was oral tradition before it got written down. Kind of like the OT, though the NT was written down within a century of the actual events; probably the Evangelists saw things fading from living memory and recorded them so they wouldn’t be lost.